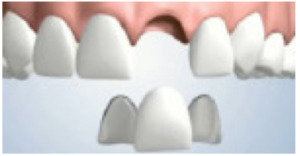 Although dental crowns and implants are the most common solution for missing teeth, and are usually the preferred treatment option to restore a broken tooth to its original shape, to strengthen a weak tooth, or to improve the appearance of a tooth, sometimes a dental bridge may be the best option if there are teeth present adjacent to the missing one. 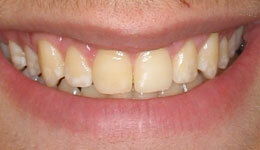 Basically, a dental bridge is a crown secured on either side by two crowns placed on adjacent, filed down teeth. Dental bridges consist of two main parts: anchor crowns and pontics (artificial teeth). 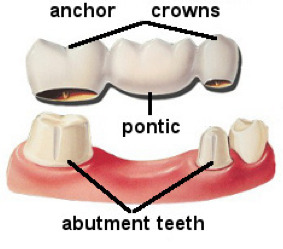 The anchor crowns affix to abutment teeth (existing adjacent teeth or bridge-supporting implants) which are bound to the pontic or pontics between them. A dental bridge can have up to two pontics, depending on the space of the gap — or number of missing teeth — between your existing teeth. These pontics can be made of a variety of materials including gold, alloys, porcelain, or a combination of the three. 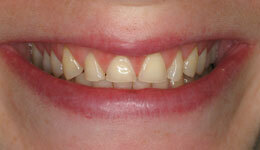 The abutment teeth can also be replaced, if they are too deteriorated to support the bridge, with dental implants. The components of a dental bridge. The placement of a dental bridge provides support to the dental arch as well as preventing teeth from migrating, which could lead to further complications including periodontal disease, reduced ability to chew properly, and poorer pronunciation — not to mention a decreased aesthetic value to your smile. Our dentists will most likely recommend a bridge if you have 1-2 missing teeth and the surrounding teeth are not 100% healthy, but intact (they would have to be filed down, destroying part of their healthy structure — a dental implant may be recommended in the case that your adjacent teeth are not strong enough). Prevent complications missing teeth cause. If you have suffered the loss of a tooth, it is imperative that you seek professional help to prevent further oral health deterioration. 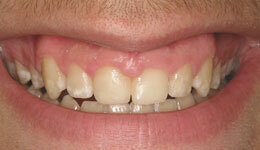 Missing teeth can cause a variety of complications, most notably tooth migration. Because of an absence of counter-pressure while chewing, the tooth or teeth above your missing tooth will eventually begin moving down or upward to fill the gap. These displaced teeth have a tendency to develop periodontal (gum) disease around their exposed roots causing acute pain while eating, talking, or chewing. Alternatively, teeth on either side of the gap left behind by the missing tooth (called the edentulous space) will slant inward toward it to fill the gap. In either of these situations, designing and implanting a replacement tooth becomes incredibly difficult, painful, and time-consuming. Furthermore, missing teeth eventually cause bones to deteriorate, causing your facial features to sag and droop. Replacing the missing tooth will help ensure bone strength and keep the shape of not only your beautiful smile, but your face as well. What does a dental bridge treatment involve? 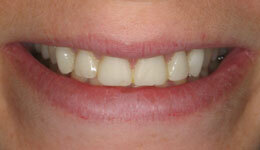 We will get your smile back to radiant in just a few visits! During your first appointment, your dentist will prepare the abutment teeth, recontouring them by scraping down enamel to allow the crown to be placed over them. Your cosmetic dentist will then make an impression of your teeth which will be sent to the lab and used as a model for the construction of your bridge, pontic, and crowns. A temporary bridge will then be placed to protect the exposed abutments and gums while your permanent bridge is created. After at least two weeks (unless a rush order is placed), your bridge will be ready for installation. During your second visit, your dentist will remove the temporary bridge to check and adjust your new bridge in order to achieve the perfect fit. Depending on the severity of your case and the way your mouth adjusts to the bridge, your dentist will apply a temporary cement in order to observe the fit over the next few weeks. Once you and your dentist are certain it’s properly placed and integrated, your dentist will permanently cement the porcelain or metal bridge in place. How long does it take to adjust to a dental bridge? Depending on the severity of the case, and on your unique personality and healing time (in general), adjustment to dental bridge can range from a few days to 3 weeks, with minimal pain. Can I eat with dental bridges? Yes, eating becomes much easier once you’ve adjusted to your new teeth. However, it is advisable to only eat soft foods (no corn on the cob, hard candy, etc) until you become accustomed to the bridge. The health and strength of your remaining teeth and gums is vital to making sure your bridge lasts as long as possible. The foundation provided by the surrounding teeth is paramount to the bridge functioning properly, therefore maintaining a good oral hygiene regime of brushing twice and flossing once a day is an essential part of your post-op care. We also encourage you to come back for a routine checkup and cleaning every six months. With good oral hygiene — depending on material used — your dental bridge could last upwards of 15 years! Don’t wait one more second to replace your lost tooth. Call Rockefeller Cosmetic Dentistry at (212) 581-1091 or visit our consultation request page to book your appointment today. In the event of a dental trauma or dental emergency, walk-ins are available.